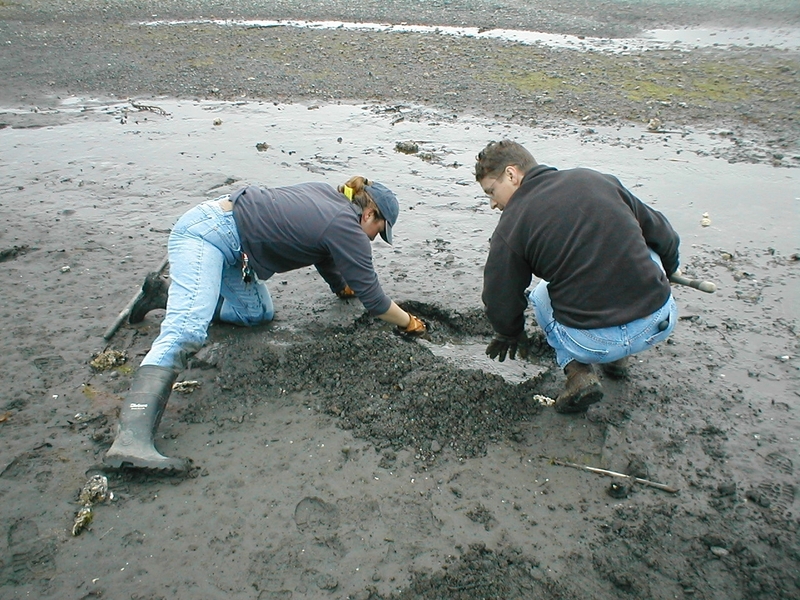 Digging for clams on cold, wet spring days didn’t sound alluring to me. But after hearing how much my husband and daughters enjoyed their forays, I finally joined them a few years ago. There is something positively magical about this iconic Pacific Northwestern hobby. Even if the rain is spitting out of the sky and blanketing my face, I forget about getting wet within minutes of stepping onto the beach. My husband and oldest daughter find a good digging spot while my younger daughter and I explore the habitat. Digging clams is easier than I thought possible, and on most outings we have our limits within 30 to 45 minutes. This means that even on the wettest day, the rain doesn’t matter for at least an hour or two; my whole family takes time to examine and watch the wild world; and dinner that night is centered on delicious clams. Read on to learn the basics of this endeavor and the best beaches for clamming. We’ve also included a section on razor clamming on the Washington coast. 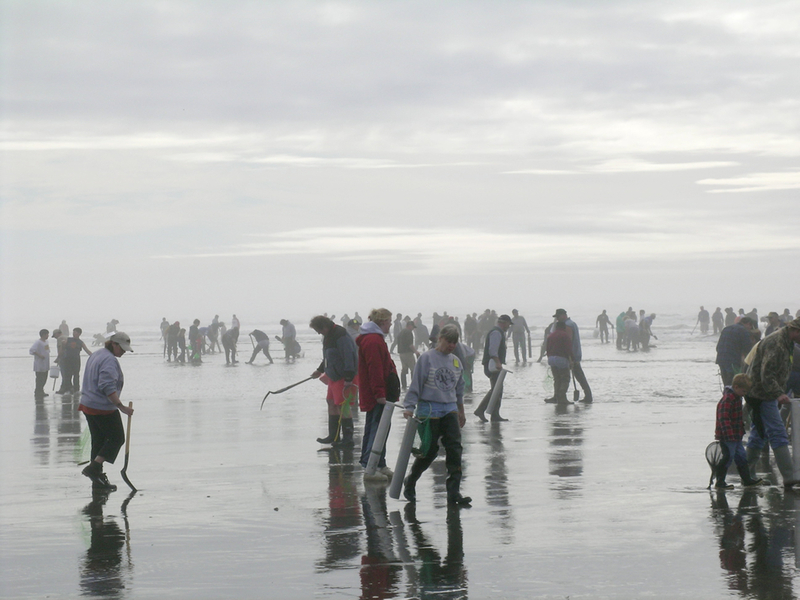 It’s a longer trek to partake in this type of clamming, but a razor clam dig is truly a fun, festival-like outdoor sporting event. Put together a clamming day kit that will live in your car, suggests Camille Speck, a Washington Department of Fish and Wildlife (WDFW) shellfish biologist who works out of the Port Townsend office. Want to see what it's like to clam (and cook) on a Washington beach? See "Forks in the Road," a short video with clamming and foraging expert Langdon Cook. Type of clams: There are several types of clams available on Washington public beaches, including littleneck, horse and butter clams, geoducks (the world's biggest burrowing clam), and razor clams (see below). License: The most important item is a shellfish/seaweed license that is good from April 1 to March 31 of the following year. The easiest way to purchase one is online; you can print out a temporary pass and your real pass will be mailed to you. Children under the age of 14 do not need a license. Limit: The daily personal limit for all marine clams is up to 40 clams but not to exceed 10 lbs. in the shell. In addition, horse clams have a separate daily limit of seven and you are allowed three geoducks daily. Tools: For digging steamer clams, bring simple small garden tools including a rake and a trowel. Most clams are not far under the surface. For example, steamer clams are 2 to 4 inches down. If you are after butter or horse clams that are found at deeper levels, you will need a shovel. Rubber-dipped gardening gloves won’t keep your hands dry but they will keep them cleaner and protect hand from glass and other small impediments. Throw in a roll of toilet paper for beaches without facilities. You’ll need a 5-gallon bucket with a tight fitting lid to bring home your clams. Each person’s limits must be kept separate until leaving the beach, so you’ll need a net bag for each harvester; this also is helpful for rinsing clams of sand and grit. Pick up plastic clam, shrimp and crab gauges, which are cheap and sold at most sporting goods stores. You’ll need a scale that hooks onto a bucket (also sold at most sporting goods stores) for larger clams (like butter and cockle clams), since you will exceed the 10 lb. weight limit before you dig up 40 clams. Tide charts: Most importantly, know the time of the low tide for your clamming beach. Look online here for tide charts. You have about a four-hour window around this tide. The best steamer clamming tides are between a tide height of 0.0 and -1.5. There is no need to wait for the lowest tides of the year to gather steamer clams. Boots and clothes: Lastly, but perhaps most importantly, pack rubber boots. I always pack complete changes of clothes for myself and my daughters, and we use part of the kit perhaps fifty percent of the time. The learning curve for clamming is blessedly short. Here are top tips. Follow the clammers. First, look for people on the beach who are successfully harvesting clams. This is the area of beach where you should start digging. Each type of clam lives along a certain band of the beach and at a certain depth. The WDFW website has a page with information on every species. Look for the show: Before you start digging, look for a hole or dimple in the sand or mud. This is called “clam show” and it means the clam has withdrawn its neck after feeding and started to dig back down in the sand. Sometimes water or sand squirts out of a hole when you walk nearby it. Then dig until you reach the clams. Steamer clams are just 2 to 4 inches below the surface, while butter clams are a foot deep and horse clams are roughly 1.5 feet deep (you need a shovel for these deeper clams). Measure: Measure each clam with your gauge; each clam needs to be at least 1.5 inches wide (across the longest part of the shell). To make sure the clams you keep are of legal size test them to see if there is a way they will NOT fall through the hole on the shellfish gauge. Place ones that are too small back in the muck. Count your limit; the counting task is a great way to involve your younger children. Fill each hole: After you are done digging, fill the hole. Some clam species need the holes filled up for survival, and the humans on the beach need the holes filled so they don’t trip and possibly fall. Fish and Wildlife officers can cite shellfishers not filling holes and fines start at $75 per hole. Pack the clams to take home: On clamming days, you may meet a WDFW staffperson counting limits in the parking lot. After you have had your limits counted, fill your bucket with salt water for the drive home. “Cover your clams with at least six inches of water and keep it cold. Float a cooler pack in it on hot days,” says Speck. “The clams need a minimum of four hours in this water to purge their bodies of grit and sand." She likes to purge her clams overnight. Let them spit: Once the clams have purged, Speck likes to wrap her clams in a wet dishcloth, putting them in a colander with a water-catching container underneath it and placing this in the fridge overnight so they can spit out more water. She prefers to cook the first portion of her harvest the next day. My family always has some of our catch the first day. And you can cook them on the beach; see this video. Preparing clams is easy and the Internet has a plethora of recipes. Shelf life: Speck recommends eating Manila clams within three days of harvest. Butter clams and horse clams each need a rubber band around them for fridge storage (and the same dishcloth arrangement) and they should be cleaned or eaten within 24 hours. Meats can be frozen for later use. 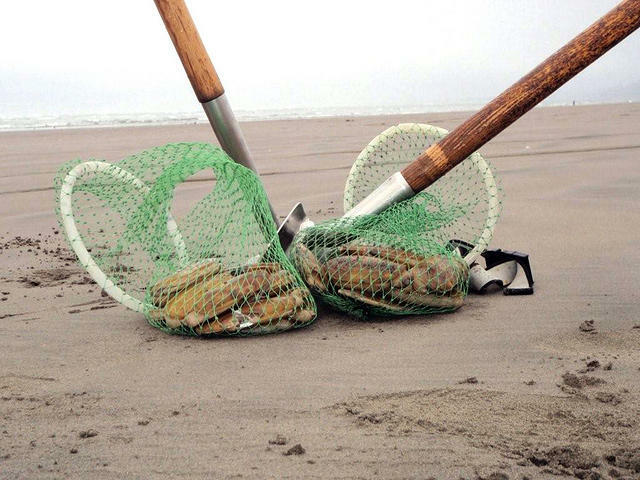 A key razor clamming event in the season occurs annually in April, the Long Beach Razor Clam Festival. Tides and times for razor clamming: During the fall and winter, the low tides are in the evening, so people start as the light fades form the sky and finish in the dark with lanterns lighting the digging. In the spring, the low tides are in the morning, making for easier daylight digging (although the dig may start before the sun rises, depending on the low-tide time). 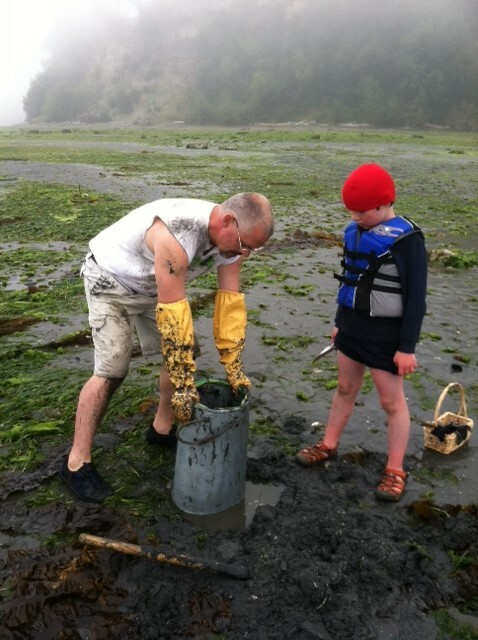 Check the WDFW site for razor clam dig days for this April and May. Tools: Tools include a specialized digging tool, either a PVC tube or an aluminum tube that brings up a core of sand. "You repeat this a time or two and you find the razor clam inside the sand,” says Dan Ayres, WDFW’s coastal shellfish manager. Limits: The daily limit for razor clams is the first 15 dug regardless of size or condition and each limit must be in a separate container. You can learn how to shuck the clams and take out the digestive material on the WDFW website, where you will also find plenty of recipes. Or just ask one of the hundreds of people on the beach for instructions. So now you know how to clam. What about where? There are many ways to find a great clamming beach. The WDFW website’s has excellent beach-finding tools. Find a beach by map location, or view all beaches, or see this bar chart that comes out each January. You can even search by distance from a zip code. Once you've identified a beach, check two websites to see if a beach is open: The WDFW opens beaches based on historical and projected recreational use patterns and the abundance of shellfish populations. The Department of Health (DOH) makes sure the population is safe for humans to eat. 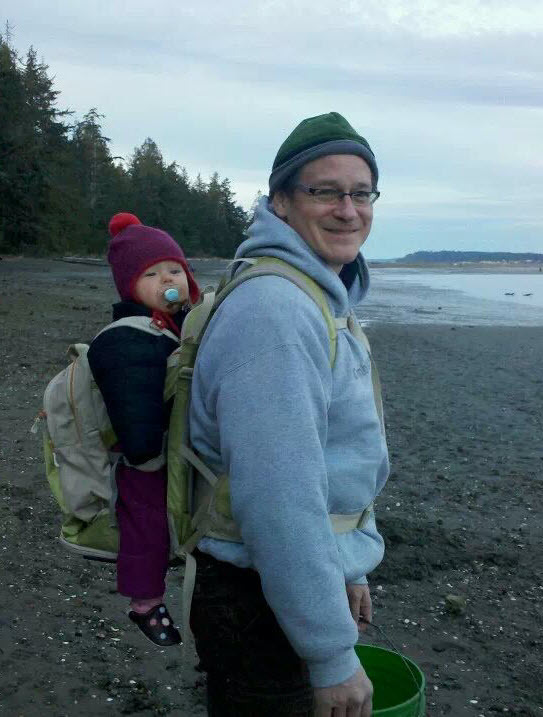 Here is a list of family-friendly Puget Sound beaches for clamming, meaning they are relatively easy to walk on and have bathroom facilities. Check the website's for proposed clamming dates for this year. The parking lot is right on the tidelands and has a pit toilet. The best clamming is in the big flat directly off the parking area. This beach is close to Port Hadlock and Port Townsend. This beach on Hood Canal, has pit toilets and an easy trail to the beach with clamming just a few hundred feet from the parking lot. Although this isn’t the most scenic beach, small clams are plentiful here. The minimum size for clams here is 1 1/4 inches (the size limit on all other beaches is 1 1/2 inches). Harvest is restricted to daylight hours only. This beautiful WDFW tideland — look for elk and bald eagles — is open year round for shellfish collecting. There are no restrooms and the walk from the parking area off Highway 101 is level but could be too far for very young children. Open year round for clams and oysters; check DOH link for possible closures. Kids like to play in the lagoon backwater here and there is a first come, first serve campground here. This beach is enhanced with planted Manila clams and it is an excellent beach for butter clams and native littlenecks. This south Sound beach has an abundant clam population and a planted oyster bed, but arrive early as there is very limited parking with no shoulder parking. This huge beach in Whatcom County has an abundant butter clam population, a decent Manila clam population, and is a good place for crabbing. Open year round for clams; always check DOH link for possible closures. This Whidbey Island beach has two access points (one of which has benefitted from natural set of Penn cove mussels from the nearby aquaculture operation) and a good population of native littlenecks and butter clams. It’s also legal to harvest seaweed here. Visit historic Coupeville, too. Open year round for clams and oysters; check DOH link for possible closures. Near Belfair, this beautiful beach has camping, a swim area, and you can harvest oysters here year-round. Some people consider this beach the holy grail of clamming in the PNW, with one of our state’s largest most productive tidelands. Make your outing an overnight by booking a campground. Editor's note: This article was originally published in 2014, and updated in 2017.